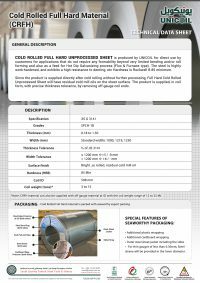 Cold Rolled Full Hard Unprocessed Sheet is produced by UNICOIL for direct use by customers for applications that do not require any formability beyond very limited bending and/or roll forming and also as a feed for Hot Dip Galvanizing process (Flux & Furnace type). The steel is highly work-hardened, and exhibits a high resistance to denting, etc. with Hardness of Rockwell B 85 minimum. Since the product is supplied directly after cold rolling without further processing, Full Hard Cold Rolled Unprocessed Sheet will have residual cold mill oils on the sheet surface. The product is supplied, in coil form, with precise thickness tolerance, by removing off-gauge coil ends.